Kerry Archæological Magazine, 1917-1918, p. 171 - 190; 223-255. We now proceed to give some account of the Mahony families of Kerry, or at least those of which we possess any information. The common ancestor of them all was Dermod O’Mahony Mór, Lord of Ivagha (circa. 1,300), So says Sir Ross O’Connell, though strange to say he calls that chieftain "Lord of Kinalmeaky." Canon O'Mahony seems to have been of the same opinion. These are both high authorities. This is however a fact which the compilers of the pedigrees of the various Mahony families (except that of Kilmorna) published in Burke's "Landed Gentry" up to the present have overlooked or not been cognisant of. At all events they make no reference to it. As we have already mentioned, Dermod Mór had, previously to his death in 1327, arranged that Rosbrin Castle, and 18 plowlands along with it, should be given to his younger sons, Donal and Dermod Og. But the eldest son, Finghin, on his accession, refused to carry out this provision for his younger brothers. For this reason they decided to leave Ivagha. Donal went to Kilnaglory in East Muskerry, where, probably through the influence of MacCarthy Mor, then the overlord of that part of the country, he received a grant of all or some portion or that townland. Dermod, his younger brother, went to Desmond and received a hospitable welcome from MacCarthy Mor, who made to him a grant of land. From the interest which this chieftain took in the two brothers it seems not improbable that he was related to their father. Dermod was the founder of the sept called "Sliochd Dermod Og." His descendants gradually acquired more possessions, and in time came to wield a good deal of influence. This sept survived the downfall of the parent septs of lvagha and Kinalmeaky, and have had, for several centuries, a prosperous career and have lived in good repute. In the Penal days it contributed a large number of officers, some of high distinction, to the Irish Brigades in the French and Spanish services. Even at the present day it maintains a good position, though its numbers have considerably dwindled away, and during the past few years no less than three of the Kerry branches have become extinct in the male line. The principal Kerry branches are those or Dunloe, Dromore, Castlequin, Cullina and Kilmorna, though the first, second and fourth are now represented only in the female line. Amongst branches wholly extinct we may mention those of Cappanagrown and Valencia. Dermod Og must have left lvagha in 1327 or soon afterwards. It is known that he was alive in Desmond in 1355, but there is no record showing the date of his death. His only son Sean (or John) married the daughter of' Aodh O'Connell,5 and had a son Dermod, who was alive in 1442, and married Sabia, daughter of O'Sullivan Mór of Dunkerron. He had two sons, Conchobar (or Conor) and Donal. Conor appears, from a document of 1471, to have been then living, and to have married a daughter of Geoffrey O'Donoghue, grand-daughter of MacCarthy Mor. His son was Tadg, or Teig, a notable member of the family, who was known as Teig Mergach.6 He was Seneschal of Desmond under the Earl of that name, and was one of the Irish chieftains who, in 1536, signed with Lord Deputy Grey a treaty of peace and submission, renewing their engagements to the English Government. Amongst others who signed that treaty was Donal-an-Dromin MacCarthy Mor, Prince of Desmond. O'Hart says that he then delivered in to the Lord Deputy's hands, as hostages for future fealty, "Teig and Dermod O'Mahony, his kinsmen." Could those have been Teig Mergach and his eldest son Dermod? It is not clear, however, how they were kinsmen of MacCarthy Mor, hut they may have been. Teig Mergach was the ancestor of most if not all of the Kerry Mahonys. He married Honora, daughter or Dermod O'Sullivan Beare, by Lady Eleanor Filzgerald, daughter of Gerald Earl of Kildlare, and left eight sons, namely: (1) Dermod, (2) Conor, (3) Donal, (4) Fineen, (5) Maolmuadh,(G) Eoghan, (7) Donogh, and (8) Seán. Dermod, the eldest son died before 1588. Conor, the second son, died in 1578, according to an inquisition held in 1626, which declares that Cnogher MacTeig Mergeach was seized, as of Fee or the Plowland of Ballyaher,7 and that John was his son and heir, and was of full age. Donal, the third son, was caned "Donal-na-Tiobraide," from property he held in the Tubrid,8 a district of Iveragh. By reason of the death of his two elder brothers he had become head of the Kerry Branch in or before, 1588. In that year he is referred to in a State Paper under the name of "Donal Mac Tybert" as the head of a popular sept called the "Mergies" (recte O'Mahony Mergeach,), the chief officer of the MacCarthy Mor's territory, and the foster-father of the "young ladye" (ElIen, daughter of the Earl of Clancar) who soon afterwards married Florence MacCarthy." Her marriage, though opposed by the English Government, was, according to Sir Warham St. Leger, favoured and abetted by certain parties, amongst. whom he mentions O'Sullivan Mor, Seneschal of Desmond, MacFinn (Lords of Lesser countries) and Donal na Tubride, head of the O’Mahony Mergeaches. A few weeks later, on the 1st July, 1588, when the dreaded marriage had taken place, Sir Thomas Norreys, the President of Munster, wrote to say that he had apprehended the Countess of Clancar, MacFirnnin and Teig Mergach―meaning no doubt his son DonaI, as Teig himself died in 1565―as being privy to the practice. In the book of Survey and Distribution we find that one of Donal's grandsons named Cnogher, with DonaI Oge Carthy of Dunguil, had, in Iveragh, 1596 acres between them, which they lost by confiscation. Several of Donal-na­Tubrid's grandsons were living in 1680. From one of them descended Count Bartholomew O'Mahony (of whom further on), and his uncle, Dr. O’Mahony, "Medecin du Roi" (temp Louis XV), and a great benefactor of his exiled country­men. Their family had settled at Knockavola in Co. Kerry. Finin, the 4th son of Teig Meirgeach, had four sons. Of these Dermod and Conor "went to Spain with all their families." John, who remained in Kerry, had a son known as James the "Provincial." Maolmuadh, the 5th son, and Eoghan the 6th, went to Spain with all their families. Eoghan, however, appears to have been a man with a history. He was an intimate friend of FIorence MacCarthy, son-in-law of the Earl of Clancar, and it was to his house in Kerry that Florence sent his eldest son, when Sir George Carew was looking out for the boy to retain him as a hostage. From the "Pacata Hibernia" it appears that Florence was about to yield to Carew's importunity to produce him, and wrote to Eoghan to bring him to Cork, but subsequently countermanded this order, on getting an encouraging message from O'Neill, and directed Eoghan to convey the boy back to Desmond. Eoghan joined O’Neill, and in consequence was reported to the Government as a "notorious rebel" by one Teig Hurley, in a lengthy affidavit which he made on the subject of Florence MacCarthy's "Treasons and Intentions" on the 27th Match, 1617. He states that Eoghan, despairing of pardon, had fled into Spain with O'Sullivan Beare "where being entertained into the King's service he was made his prisoner. "9 He then goes on to say that Eoghan (probably after his return from Spain) came into London, and two or three times visited Florence in the Marshalsea, and at the end of a "sennight or thereabouts," leaving a son of his with Florence, he, managed to obtain a pass from the Custom House and "went to the Low Countries." Teig Hurley adds that the son whom he left with Florence McCarthy died "a quarter of a year" afterwards of the "plague." These facts go to show that Eoghan Mac Teig must have been a man of energy and enterprise. Donogh, the 7th son of Teig Meirgeach, is stated to have had two sons:―Conor, who went to the Low Countries, and Kean, who became the ancestor of the Mahonys of Brosna-Kilmorna. An Exchequer Bill of 1708 speaks of Kean's grandson "Cornelius Mahony, gent," as settled in Brosna in 1699. This was the first of the O'Mahony families who settled outside MacCarthy Mor's portion of Kerry. Pierce Mahony of Woodlawn and Kilmorna (b. 1792, d. 1853) M.P. for Limerick and Kinsale, purchased Kilmorna and Gunsboro from Robert Gun-Cuninghame, D.L., about 1840. when his eldest son married the daughter of the vendor. When their son, George Philip Gun Mahony, D.L., died in 1912, he left Kilmorna, &c., to his half-sister, Mrs. de Janasz, who is the present owner of the property. Seán (John) the 8th son of Teig, was the ancestor of the families of (1) Dunloe, (2) Dromore and (3) Dromadisert. As regarding these families we have, more information than of the rest, we propose to deal wit.h them in the first instance. Seán, the 8th son of Teig Meirgeach, who is said to have married a daughter of Lord Muskerry (which Lord Muskerry we are not informed), had two sons :―Donchadh (Donogh or Denis) and Sean Og. The elder is said to have married a daughter of the Lord of Coshmang, and had a son John, who became known as "John of Dunloe," He married firstly Honora, dau. of Maurice O'Connell of Cahirbarnagh, by whom he had two sons: Daniel, the founder of the family of Dunloe, and Denis the founder of that of Dromore. He married secondly Gillen, daughter of O'Sullivan Mór, whose marriage portion, the townland of Dunloe, then passed to him. For his second son, Denis, the Dromore estate was acquired in 1686, and the latter became the founder of the Dromome line. By his second wife John Mahony had three sons, John, James and Philip. The CastIe of Dunloe was built by the Fitzgeralds in 1215, and afterwards came into possession of the O'SuIlivans. It was until the Desmond Rebellion, one of the chief fortresses of the latter, but was then razed by Ormonde, who left standing only the north, west, and south walls of a flanking tower. O'Sullivan then removed to Dunkerron, where in 1595 he built the Castle, of which the ruins now remain. Some 70 years afterwards Dunloe passed to John Mahony, on his marriage to his second wife Gillian, dau. of a subsequent O'Sullivan. It is even said that Mahony had leased it from O'Sullivan before the marriage. Anyhow he rendered the castle habitable by building an east wall in place of that levelled by Ormonde, and thus the Castle stands to this day, the 17th Century wall being easily distinguishable from those built four centuries earlier, which are of immense thickness. John Mahony died in 1706. His eldest son, Daniel, inherited the estate and castle of Dunloe. He appears to have been a very remarkable personage, with exceptional force of character. He greatly extended his possessions by following a course, initiated by his father, of obtaining middle interests from the new landed proprietors, who had got large grants of confiscated estates, and who, being mostly English and absentees, were ready to lease their lands on easy terms. He took the lands as Trustee for a number of his neighbours, to each of whom he made a sub-lease, and in this way got an interest in an enormous tract of country, for which he paid head rents amounting in the aggregate to about £1,500 a year, equivalent to about three times that amount at the present day. That Daniel Mahony, being tenant to various landlords over a large tract of country in the Baronies of Dunkerron, Iveragh, and Maganihy, mostly inhabited by Papists, had for seven or eight years "contrived a way to make himself great and dreadful in this country, wheresoever he or those under him had any disgust or animosity." That his tenants, numbering about 4,000, all Papists, assemble in great number at night, "smocked, with their faces blackened" so as to escape recognition, an give an onsett in the nature of Fairesses"10 going where directed by Mahony; being known as his" Fairesses," and ready on all occasions, day or night, to "answer his expectations." That, in consequence of this, none dare execute any judicial orders against them, or O’Mahony himself, and hearth­money collectors and other civil officers are in danger of their lives. That he, Mahony, conceals between himself and his adherents £100 per annum of land. That he lives in his Castle of Dunloe weIl-fortified and the strongest hold in the county except Rosse Castle." This extraordinary document winds up by a suggestion that a foot company be ordered to garrison the said Castle in order to "civilise the said Mahony and his mobb of Fairesses." No notice being taken of this petition, Maurice Kennedy had to dare all hazards, and lay one signed by himself openly before the Privy Council, backed by sworn information given before a magistrate. There is nothing to show, however, that, this appeal had any more effect than the former anonymous one. The immense power which Mahony wielded, at a time when the Penal Laws were in full operation, seems to have made a deep impresssion on Froude, the historian, who speaks of him as the "great and Terrible Papist who ruled South Kerry with his 4,000 followers." As he observes, the Viceroy might be supreme in Dublin Castle, but Daniel Mahony was sovereign in Kerry. It is hardly necessary to say that a Dublin Lord Lieutenant in 1717 was no match for Daniel and his Four Thousand. And in all probability the Government desired to hear as little as they might about administrative weakness. Daniel died in 1747. He left, with other issue, a daughter, to whom, as the only person in the barony worthy to wear them, he bequeathed his velvet breeches! This lady, it may he mentioned, was the wife or Donal O'Donoghue, and mother of Mary O'Donoghue (known as Maur-ni-Dhuv), who married Daniel O'Connell, grandfather of his famous namesake the "Liberator!" I. John, of whom presently. a. Lucy, md. ― Quill, and had a son Arthur, and a daughter Anna, who md. Patrick Maxwell and had a son, John. b. Zonobia, who md. Timothy O'Sullivan of Coom. c. Jane, md. Captain Townsend. e. Frances, md. her cousin, Daniel, of Dunloe. 2. James, Lieut. 77th Regiment, d. unmd. Served in the American War (as did also his brother-in-law, Lieut. John Comerford). Was afterwards in the Kerry Militia and taken prisoner at Castlebar by General Humbert, who gave him a permit. a. George, 57th Regt., d. unmd. (a.) Thomas Sullivan Green, J.P. (b.) James Sullivan Green, Lieut.-Col.
(c.) George Comerford Green, Co. Court Judge. (d.) Maxwell Sullivan Green, Chairman Irish Prisons Board. (b.) Anne, d. unmd. 1909. (1) Robert; d.s.p., and Catherine d. unmd. III. Dermod was an Officer in Dillon's Regiment. He had a son, John Francis, who became a Colonel in the French Service. This John Francis Mahony md. a Miss Power, and they had a son named Ernest Count Mahony. III. Denis, Lt.-Col. 1st Foot, served in India 1792; d.s.p. 1813. 1. John, who md. and had a dau., Lucy, who md.―McNemara. a. Thomas, a Land Agent. b. (Rev.) Peter, S.J., a well-known preacher. a. Catherine, who md. James Scully of Shanballymore. II. Elizabeth, who md. Daniel Sullivan of Ringdonagan. I. Daniel, his heir. II. John. Ill. Patrick. IV. William. V. Denis. VI. Darby. I. Mary. II. Margaret, md. John Shea Lawlor. I. John Moore, his heir, b. 24th January, 1841. II. Daniel, b. 8th April, 1845. II. Elizabeth, d. 13th Dec., 1862. 1. William Charles. 1. Maureen Elizabeth. She md. 2ndly, 2nd June, 1881, Major-General Cecil Mangles. IV. Margaret, d. 4th March, 1863. V. Marcella. JOHN MOORE MAHONY, J.P., High Sheriff 1875, md. . . ., d.s.p. 19th Oct., 1908. (1.) Clara, md. Dr. L. Griffin. c. Eliza, md. ___ Mahony. (1.) Thomas Moriarty, who md. Miss Fitzpatrick, whose dau. md. Sir Thomas Dennehy. (1.) Maria, who md. John Dennehy, father of Sir Thomas Dennehy. 3. Kean, grandfather of Sarah Mahony (who md. Sir Arthur Blennerhasset), aan of her brother who md. Eliza, .dau. of James Mahony. III. Daniel, who md. and had a dau., who md. ____ Doran, of Blackwater Bridge, and another dau. who d. unmd. I. Julia, who md. Count James Conway. II. Clara, md. 1stly James Segerson and had a dau. Eleanor Segerson, who md. Matthew Moriarty. She md. 2ndly, Geoffrey O'Connell of Ballinablown. III. Arabella, md. ____ O'Connor. IV. Alice, md. Peter McSwiney. V. Catherine, md. Justin MacCarthy of Ardcanaghty. VI. Daughter md. John Bernard. I. Denis of whom presently. I. Honora who md. Hugh Falvey. II. Richard, who md. Charlotte, dau. of the 1st Lord Ventry. I. Catherine, who md. 1stly Darby Magill, and 2ndly (Francis) The MacGillicudy. II. Sarah, who md. Christopher WiIloe. I. Denis, of whom presently. I. Agnes, who md. Robert Conway Hickson, of Fermoyle. I. Richard John, of whom presently. II. Denis, d. July 1831. III. Edward, d. unmd. 1883. V. John, d. unmd. 1880. I. Rose, md. 1stly, 1852, John Penneyfather, son of Baron Penneyfather; 2ndly, 23rd Sept., 1858, Admiral the Hon. Henry Carr Glynn, R.N., C.B., C.S.I., and d. 21st July, 1870, leaving by him, who d. 16th Feb., 1884, two sons and two daughters. II. Margaret, md. 18th Oct., 1866, Honble. Reynolds Moreton, Capt. R.N. retired, son of Henry, 2nd Earl of Ducie, and has issue one son and two daus. Ill. Mary Ellen, d. February, 1875. I. Harold Segerson Mahony, J.P., b. 13th Feb., 1867, d. unmd. 1st July, 1905, his death being caused by a bicycle accident. I. Norah Eveleen, md. 22nd Oct., 1900, Edward Hood, son of the Hon. Albert Hood, 2nd son of the 3rd Viscount Hood. Sean, the 8th son of Teig Mergach, had, as we have above stated, besides his elder son, Donogh (ancestor of the Dunloe and Dromore Mahonys) a second son, Seán Og, who (as appears from a document in the Public Record Office) owned the lands of Dromadisert, Duneen, Knockanlibeare, and Tuarnanonagh. He died in 1642. He had two sons, Teig and Dermod. The eldest son, Teig, married in 1660. In 1663 the Duke of Ormond, failing to establish his claim to the immediate ownership of several estates in Kerry, including the lands in the possession of Teig Mahony, executed a deed, waiving, in favour of the latter and two others, namely, Colonel MacFynine and Lieut.-Colonel McGillicuddy, the possession of lands in the Baronies of Dunkerron and Glanerought, and claiming only the chiefries due to him out of them. Teig, being cut off from the chance of fee simple ownership, set himself to acquire as many middle interests as possible. It is not quite clear when he died, but he is said to have been alive in 1700. His son, John, who in 1686 had married Ellen, daughter Dr. Stephen Rice, of Castlemore, Co. Kerry, in 1700, lodged his claims, with the title deeds, with the Trustees of Forfeited Estates. He succeeded in retaining most of his lands in Kerry, but had to give up Kilmeedy Castle, Co. Cork, and its adjoining lands which his father had acquired some fifty years previously. After his death, in the early part of the 18th century, he was the subject of a beautiful elegy composed by the poet O'Rahilly, who dilated on his illustrious descent and his wealth and generosity. His son, also called "John of Dromadisert," made his will in 1727, appointing, as one of the executors, his cousin Daniel of Dunloe. We are unable to trace this family down any farther. We shall go back now to Dermod, the brother of Teig, and younger son of Seán Og. This Dermod had five sons, the eldest of whom was Conor (or Cornelius). In 1689, when Tyrconnel issued a general call to arms, a company was raised in the barony of Maganihy composed of members of the Mahony gens. It was joined by Cornelius, who obtained the rank of Lieutenant, and two of his brothers. This company formed part of General Justin MacCarthy's army, which besieged and took Bandon in 1689. Cornelius' two brothers were killed during the campaign. He himself, during the attack on Bandon, saved the life of a Williamite gentleman named Hungerford, who, at the conclusion of the war, out of gratitude, made him a grant of some land near the round tower of Kinneigh. (It is needless to say that Cornelius' own lands in Kerry were confiscated. He died in 1728, and was buried in Kinneigh graveyard. His grandson and namesake died in 1797, aged 74 years. The great grandson of the latter was John Canon O’Mahony, P.P., of Kilmurry, Co. Cork, the author of the "History of the O'Mahony Sept."
"Florence, son of O’Mahony of Rosbrin (Kean son of Conor O’Mahony Fionn) third ill descent from Florence, brother of Darby; whose (Florence's?) father forfeiting in Elizabeth’s reign, joined his relatives, the descendents of Darby, in Kerry, and was father of Myles of Tinchalla and CuIlina (date 1694, documents executed by Myles), who was fafher of Kean, ancestor of the Castlequin branch, and of Florence ancestor of the Cullina." 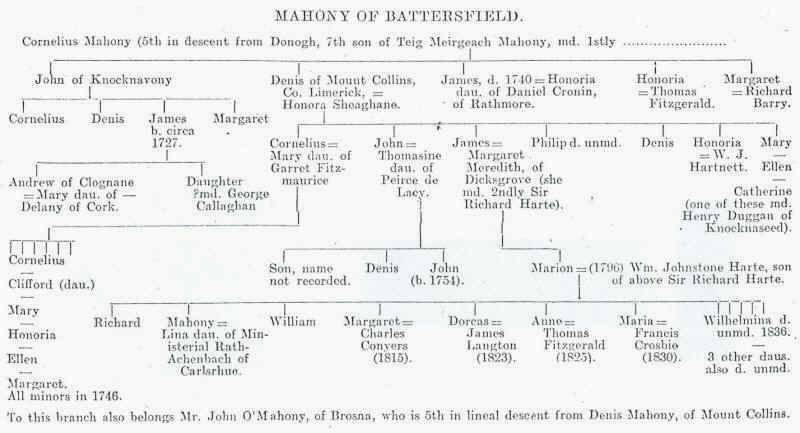 On the other hand, in the edition of Burke's "Landed Gentry" for 1875, under the head of "Mahony of Castlequin," the lineage of that family runs as follows:―"The Mahonys of Castlequin are descended from Kean, the son of Kean O'Mahony of Kinalmeaky, Chief of Carbery, who forfeited his possessions in the reign of Elizabeth, on suspicion of being implicated in O'Neill's rebellion. He removed into Kerry with his seven sons, from one of whom, Denis, are descended the families of Dromore and Dunloe. The families of Upper and Lower Cullina spring from Florence, the second son of Kean, the great-great-grandfather of the late Kean Mahony, of Cullina, who died 11th September, 1862." It will be seen that this lineage is quite inconsistent with the later theory first mentioned, according to which the branches of Dromore, Dunloe and Castlequin, instead of having a common ancestor living in Queen Elizabeth's time, would have to go back some two and a-half centuries to find one in the person of Dermod Mór O’Mahony, who died in 1327! Now it is certain that in the 16th century Teig Mergach Mahony was seated in Kerry, and that he had eight sons, one of whom was the ancestor of the Dromore and Dunloe branches. Could it be that the compiler of the lineage of 1875 had in his mind these eight brothers, and somehow was erroneously led to think that their father had only recently come to Kerry, instead of being the descendant of one who had settled there in the 14th century? Myles Mahony of Dromin, the earliest of the Castlequin family of whom we have any authentic information, in his will, made in 1726, after disposing of the various portions of his estate, appoints his "cousin Daniel Mahony of Dunloe" as one or the persons who should settle any disputes arising between his (testator's) wife and children. Had their common ancestor been Teig Mergach, one might understand the use of the word "cousin"; but it would be rather surprising in the case of persons whose common ancestor lived some 400 years previously! There is also a notice of the Castlequin family in Burkes "Landed Gentry" for the year 1844. It is merely a general statement that the head branch of the Mahonys resided formerly in West Carbery, and owned many castles there, and that in more ancient times they possessed some portion of the modern barony of Muskerry. Miss Cusack, in her "History of Kerry," says they are sprung from Kean O'Mahony of Kinalmeaky, who forfeited his lands in Elizabeth's time for taking part in the Desmond rebellion and removed to Kerry. O’Hart's account is similar, except that he calls the dispossessed chieftain Conor instead of Kean O'Mahony. Most of these accounts go to show that the branches in question have sprung from the Kinalmeaky sept, whilst according to the more recent theory, they descend from the Rosbrin sub-branch of the Ivagha sept. Further, we may state that no persons bearing the Christian names mentioned in these various accounts can be traced amongst the dispossessed chieftains or their immediate offspring, as given by Canon O'Mahony. It has been suggested to the present writer by a gentleman well informed in these matters that the Castlequins and Cullinas may be descended from Teig Mergach's fourth son, Fineen. This Fineen (or Florence) had a Maolmuadh (or Myles), who had three grandsons, Shane, Fineen, and Maolmuadh.11 The suggestion is that the third of these may have been the Myles Mahony of Dromin (sometimes called Tinnehalla) already mentioned, and is apparently based solely or principally on the fact that the two names "Myles" and "Florence" which so frequently recur in those two families are also found amongst the descendants of Teig Mergach’s fourth son. This, however, is not very much to go on. It is possible that the claim now set up of the descent of the Castlequins and Cullinas from Fineen, the eldest son of Dermod Mor, may have been the result of research, and that the compiler had some documentary or other evidence to go on, of which we are not in possession; but in the absence of such evidence we may at least say there is a good deal of uncertainty on the point. But whatever doubts may exist as to their earlier genealogy, we think there can he none from the time of Myles Mahony of Dromin downwards. We now proceed to give the pedigree of him and his descendants. I. Kean, ancestor of the Castlequin family, of whom presently. II. Florence, ancestor of the Cullinagh family (vide pedigree which follows). IV. James, who predeceased his father, and had a son named Myles. I. Kean, of whom presently. I. Dau., who md. Andrew McCarthy. II. Dau., who md. O'Moriarity of Castledrum, and had a son, Patrick Moriarty, M.D., Killarney. The latter md. 2ndly, in 1820, Elizabeth M. Mahony, and had a dau. who md. John Dennehy. I. Myles, of whom presently. II. Daniel, Lieut.-Col. 58th Foot, d. 1815. III. Denis, of the French Irish Brigade. IV. Darby, an Officer of the Army, died in Jamaica. V., VI., and Vll., John, Florence and Maurice, drowned young by the upsetting of a boat near Cahirciveen. I. Mary, md. her cousin, Kean Mahony of Upper Cullina. II. Elizabeth, md. her cousin Myles of Lower Cullina. III. Gobinet, md. her cousin Daniel of Lower Cullina. I. Myles, who d. unmd. I. Mary Anne, who md. her cousin, Thomas McDonohh, J.P., Killarney, and had beside other sons and daus. who d. young, a son, Thomas McDonogh Mahony, the present owner of Castlequin, who md. Miss Sheehan of Cahirciveen. 1. Myles, and II. Kean. II. Kean, of whom presently. I. Ellen, md. L. Cronin, and was mother of Daniel and Darby Cronin of Clounts. II. Johanna, md. B. Egan, and was mother of the Most Rev. Dr. Cornelius Egan, Bishop of Kerry. III. Honoria. IV. Catherine, d. unmd. I. Kean, who md. 1stly, Johanna, dau. of Lieut.-Col. William McCarthy, and 2ndly Anne Baldwin, dau. of Major Broderick. He d. in 1862 from a gun accident, leaving no issue by either marriage. II. Myles, M.D., d. unmd. 1. Thomas, who md. his cousin Mary Anne Mahony, of Castlequin, and had issue. 3. Francis, md. Myra O'Sullivan Beare. 4. Johanna, md. Maurice Brennan, Esq. IV. Johanna md. Maurice Brennan. II. Myles, md. his cousin Elizabeth, of Castlequin, d.s.p. III. Daniel, of whom presently. I. Elizabeth, md. ___ Leyne. III. John, of whom presently. Ill. John, who emigrated, but was never heard of. DONOGH O'MAHONY, seventh son of Teig Meirgeach O'Mahony, was father of:―I. Conor, who went to the "Low Countries," and II., of Kean (Cian). DAVID MAHONY, of the Castle, Newcastle, Co. Limerick, who md. Catherine, dau. of Pierce de Lacy, a General in the service of King James II, by Annabella, dau. of Robert Goold, of Knocksaun, Co. Cork, and had issue :―I. Cornelius, d.s.p. II. Pierce. I. Bryan, an Officer in the Irish Brigade, afterwards incorporated in the British Service, in which he was killed in action at the storming of Guadaloupe. II. Cornelius, Capt. in the 45th Regt., md. Mary, dau. of Francis Arthur, and d.s.p. III. Philip, d. unmd. in Paris. I. Mary, md. Philip Hunt of Loughborough, Co. Leicestor, a Captain in the Army, and had issue a son, also an Officer in the Army, killed in the Kaffir War. I. Peirce of Woodlawn and Kilmorna. II. David, of Grange Con., Co. Wicklow, b. 22nd Feb., 1795, md. 1824, Margaret, dau. of William Perry, d.s.p. 1845. I. Peirce K. Mahony, of whom presently. II. David of Grange Con, Co. Wicklow, J.P., D.L., d. unmd. 1900. I. Anna Maria, b. and d. Oct. 1815. 1. Montague Cholmely, b. 28th Sept., 1844. 2. Peirce de Lacy Henry, late of the Indian Civil Service, b. 1848, md. 1888, Jessie, dau. of James Sime. 1. Barbara, twin with Montague, d. young. 2. Alice Jane, md. 1901 cousin Peirce Charles de Lacy Mahony (see below). 3. Edith Maria, md. 1888, Leonard Barnard, and has issue. I. Peirce Robert George Gun, b. 1810, d. 1844. II. George Philip Gun, b. 1842, succeeded his grandfather, 1853, was High Sheriff 1876, d. unmd. 14th Sept., 1912. 1. Pierce Gun of Kilmurry, Co. Kerry, B.L., b. 1878, Cork Herald of Arms, 1905-10, md. 1903, Ethel Tindall, younger dau. of J. J. Wright, M.D. ; d. from a gun accident, 26th July, 1914. 2. Dermot Gun, b. 2nd April, 1881. Mr. Peirce C. de Lacy Mahony md. 2ndly, 1910, his cousin, Alice Jane, dau. of Lt.-Col. Johnstone; she d. in 1906. Mr. Peirce K. Mahony d. 21st July, 1850. His widow md. 2ndly, in 1856, Colonel William Henry Vicars, late 61st Regt. and d. in 1873, leaving by this, her second marriage, three sons and one dau. 5. This may have been the Aodh O'Connell (first of the name) mentioned in the pedigree of the Derrynane family, who would have lived about that period. 6. Properly "Meirgeach" meaning "rusty" or "musty" or "angry looking." He is sometimes called "Teig the Wanton," but this is an incorrect rendering of the Irish word. 7. Probably Ballyhar, in the parish of Kilcredane, Barony of Maguinhy. See collection of genealogies R. I. Academy, classed 23E, 86. 8. We do not know exactly what constituted the "Tubrid" district, unless it was that in or near Aghatubrid. This place, which is some five miles south of Cahirciveen, adjoins, though it is not part of, the parish of Dromod, where the Mahonys had a considerable amount of property, namely, at Cappanagrown, Ballinakilla, Doory, Kilemlough, &c. They also had land at Killurly and other places in the vicinity of Knockatubber. 9. Probably intended to be written "pensioner." 10. Some think this is an erroneous rendering of the Irish word "fearraidhe" (plural of "fear" which means man). It may be, however, a misspelling of the word "fairies," which they may have been called by reason of the garb in which they disguised themselves. 11. See genealogies in R. I. Academy, classed 23E, 26.